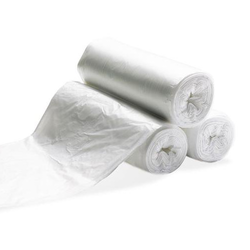 Prominent & Leading Manufacturer from Bengaluru, we offer bags on roll. We offer Bags On Roll to the clients. They can be hanged or kept vertical on a table for easy tear and use. We do customized manufacture of sizes as per the client’s requirement.These bags are used as Industrial Packing Bags, Laundry Bags, Garbage Bags, Vegetable Grocery Bags (produce bags in the supermarket) and General Grocery Bags. Looking for Bags On Roll ?